Want A Better Answer? Ask A Better Question! Answers are very much based on the question asked. Some questions will produce shallow – not insightful – answers, while other questions will open up new possibilities and paradigm shifts. If you want a better answer, you have to ask better questions. Here’s how. Much of the work I do with leaders is helping them to listen and ask good questions. Why? Because good questions are a best way to initiate innovative change – in people, processes, and products. They didn’t express empathy to the other person before exploring their situation. They got hooked by the other person’s perspective. They asked the shallow questions. Let’s explore all 3 reasons, beginning from the second. In conversations, it’s easy to get hooked by what the other person says. “Hooked” is when you focus on the situation the way the speaker views it. When we are hooked, we ask questions only from the way the other person talks about their situation. It’s very difficult to ask insight-generating questions without shifting from the way the other person has been thinking about their problem. For example, a manager complains to you about the lack of commitment of team members. You could ask: What kind of a commitment are you looking for? You’ll probably hear more complaining along with some description of the commitment the manager seeks. Or you could ask: How could you encourage their sense of commitment? You’ll get how-to answers like: discuss the need for commitment, talk individually with each team member, do some team-building activities, and cast vision for teamwork. Nothing new here. By sticking closely to the context and the way the manager spoke about it, these questions are shallow and probably won’t lead to any new discoveries or innovative solutions. If you want to produce change, don’t get hooked during the conversation. To ask better questions, don’t be hooked by the other person’s way of talking about the situation. Ask questions from different perspectives by change assumptions about the situation. How about exploring factors other than the belief that the team members are the main problem: What factors in the team’s systems and dynamics might be discouraging them from fully committing? A discussion may emerge about compensation, decision-making process, authority vs responsibility, work loads, who gets credit for wins and blame for failures, etc. In a simular discussion I was challenged with this question: How committed are you to the team’s objectives? Of course, I felt I was committed, but my friend helped me see that my actions communicated that I wasn’t committed to the project. Which was true, my interests were elsewhere. If I, as the leader, wasn’t committed, then why should they be? 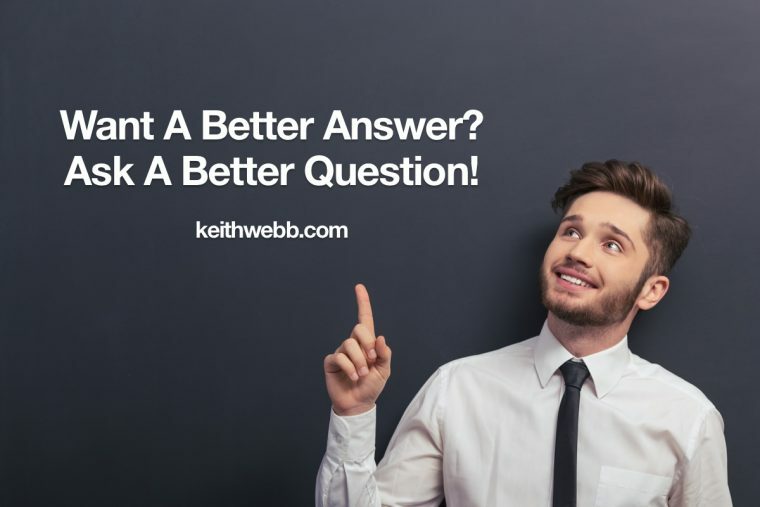 If you want better answers, you’ve got to ask better questions! It’s natural to see the other person become defensive or deflect when you change perspective on their situation. They are hooked on their own view. It’s important to first show empathy before jumping in and asking probing questions. The manager in the situation above is most likely frustrated and discouraged about his team’s level of commitment. Regardless of the cause, or even whether or not that perspective is true, we can show empathy to the manager. Say: It must be frustrating to feel like you’re the only one committed to this project. Or, I imagine it’s discouraging to not see progress after you’ve invested so much into the team. Showing empathy isn’t about what else is true. It’s about how the manager feels about the situation from their current perspective. Once you’ve expressed empathy, the other person is much more likely to engage with you in exploring their situation from other viewpoints. Your other-perspective questions are more likely to produce better answers. Expressing empathy to the person based on their current view of their situation. Avoiding becoming hooked by their presentation of the situation. Asking probing questions from different perspectives. The mark of “better” questions is the depth of reflection they cause in the other person. Generally, more reflection produces better answers.